Our Indoor Tennis Court 2 now has Playsight Smart Court technology. 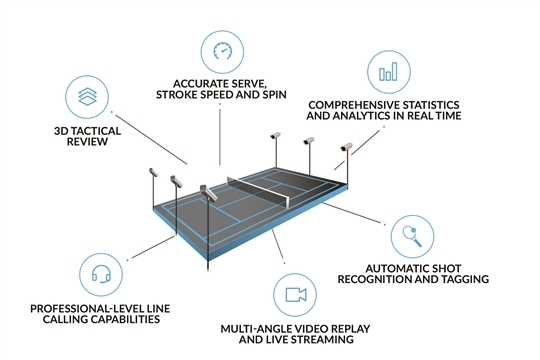 PlaySight's camera-and-kiosk system is built with state-of-the-art tennis analytics technology that turns the court into a SmartCourt, offering line calling, livestreaming, instant multi-angle video replays and detailed statistics about every shot played. Indoor Tennis Court 2 is permanently equipped with an interactive touch-screen kiosk, plus 5 fully automated HD cameras. The system uses advanced image processing and analytical algorithms to capture and log stroke type, ball trajectory, speed and spin, in-depth shot data, player movement and more. PlaySight can turn any mundane tennis drill into a real-world video game challenge! PlaySight is approved by the International Tennis Federation (ITF) as a Player Analysis Technology and is approved for use in all ITF-sanctioned tournaments. To use Playsight just book Indoor Tennis Court 2. You will need a Playsight account which is free and can be obtained from the oncourt kiosk or via www.playsight.com.